While most people no longer use phone books, many types of traditional media are still effective at attracting potential clients to your business. Advertising platforms like TV, radio, newspapers, mailers, magazines and outdoor are considered top-of-the-funnel marketing opportunities and are designed to make people aware of your brand, product or service offering, or specials that you may be running. In these cases, many people could be exposed to your ad, become aware of what you offer and might potentially become a customer. While only a fraction of people who see your ad will likely take an action, sustained advertising using traditional media is effective at building brand awareness. Today, there are many new ways to use and measure traditional media. At Proximo Marketing Strategies, we strive to find creative ways to integrate traditional and digital media in order to get more value for your advertising dollar, attract more visitors to your online presence, convert visitors, and capture information from cool prospects in hopes of turning them into loyal customers. Think about ads on TV that encourage people to learn more on YouTube or radio ads that promise exclusive offers on a website. Some mailers will offer a chance to win something online and newspaper ads will point people to Facebook for more information about an event. These are just surface examples of what integration looks like; specific cases involve creativity and have established ways of measuring the success of your traditional media investment. 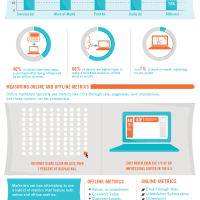 Click on the image below for an infographic that shows just how integrated traditional and digital media actually are. If you’re looking to give your traditional marketing a boost, we would love to give you some ideas and help you integrate your ads with your online presence. We offer a free, no-obligations initial consultation to learn about your business and share some insights that will get your wheels turning. At the very least, you’ll walk away smarter with some ideas for how you can fuel your business growth. To contact our team, give us a call using the numbers at the top of the page or fill out the form below.